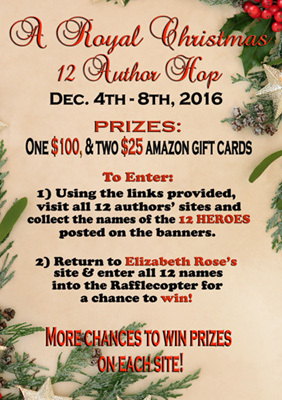 Christmas is right around the corner, and 12 authors have gotten together to bring you the chance of winning a $100 amazon gift card as well as dozens of other prizes. As you visit each author’s site to collect the featured hero name in the top banner, you might find a new author you haven’t read before. My hero is Rowen from Restless Sea Lord. (Kindle Unlimited members can now read Restless Sea Lord for FREE!) The hop is easy; just follow the directions. You will find the author links, rafflecopter, and a second contest just from me at the end of the page. It has been a busy year for me, and I have another busy year planned in 2017. 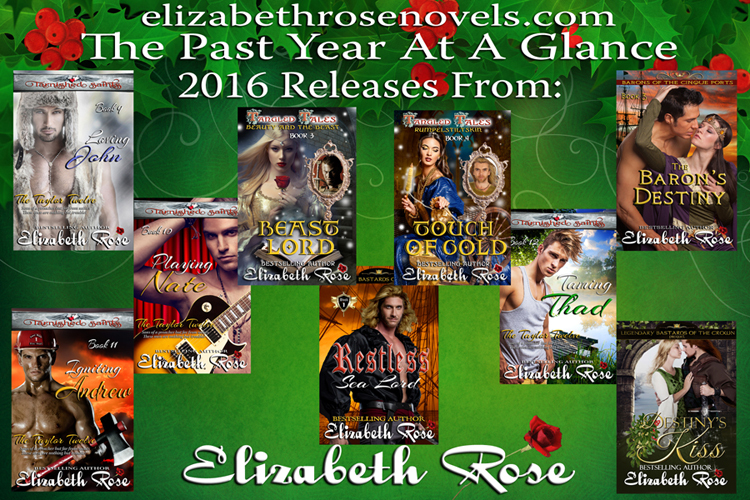 Watch for the completion of my Legendary Bastards of the Crown Series, as well as the rest of the books of my Tangled Tales Series. And did you know that most of my books can be read for free if you are a kindle unlimited member? 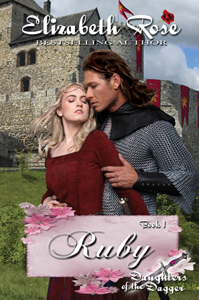 As a special bonus, during the hop, you’ll be able to pick up a copy of Ruby – Book 1 of my Daughters of the Dagger Series, and The Dragon and the Dreamwalker – Book 1 of my Elemental Series for only 99 cents each. Here is a booktrailer of my Elemental Series. (All new covers now.) And also a booktrailer you’ll want to see featuring all the authors from the hop. Thanks for the fun! The Tarnished Saints series is my favorite of yours so far.. BTW the link to your Twitter sign up is broken in the Rafflecopter, but I already follow you on twitter. I think your Twitter handle was put in the Rafflecopter incorrectly. this is fun thanks for the chance to participate… Happy Holidays! I would have to say Tarnished Saints. The Elemental series is one of my favorites but I also love Cowboys of the Old West. The Western series is my favorite so far. Daughters of the Dagger Series looks great. I like all of your books that I have read, but if I had to one it would be the Elemental Series, so far. So far, I have only read Madman McKeefe series and Medieval Maidens, and I really enjoyed them. Thanks for the fun! I’ve not read any of your books yet, but the Daughters of the Dagger Series looks amazing. Sorry I have not read any of your books , but I think I would enjoy Restless Sea Lord it sounds very interesting!! As a relatively somewhat voracious reader/book reviewer I love winning books in giveaways such as this one as I don’t accept requests to review books. I also winning Amazon gift cards so I can buy books I’m interested in reading/reviewing. Fun contest, found some new books. I find the Tarnished series and the Greek Myth series both interesting. I would like to check out the Blade series. you are a new author to me and this is an awesome way to introduce yourself. I think Ian is the one that interests me the most. I am totally about dark and mysterious. I see that it is free so I am headed for some reading on this snowy day off! Although I have not read any of your books yet, I think I would enjoy reading the Tarnished Saints series. Tarnished Saints does it for me. I haven’t read in but I think the Tarnished Saints series looks great! Your elemental series sounds awesome!! Tangled Tales series. Thanks for the chance. I haven’t read any of the books yet, but I want to read the Tarnished Saints series. The Tarnished Saints is my favorite series. Ian’s the only one I’ve read, so I’ll have to say that is my favorite! My favorite is the Elemental series. Oh to try and pick a favourite series is difficult. But I think I will choose The Daughters Of The Dagger. I do like strong heroines. Have a wonderful christmas . Well I’m new to you and your books. So I did as you asked and I looked through your site, several look good to be honest. But, your Elemental Series is my first choice, looks fabulous! I have not read any of your books yet, but Lady Renegade looks the most intriguing to me. Thanks for the chance to win this giveaway. The Tangled Tales series looks good. Thanks for the chance to win. My favorite so far is the MadMan MacKeefe series. Haven’t read any yet but the Elemental Series sounds interesting.